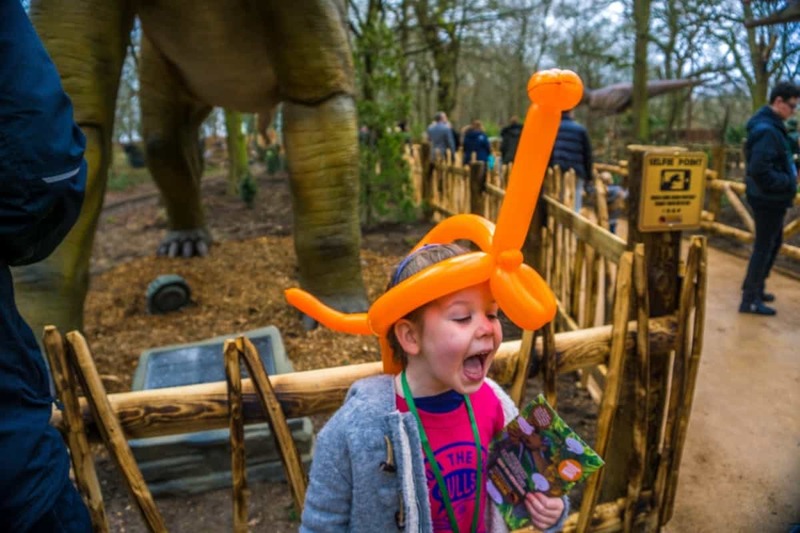 We were so lucky to be invited to Paradise Wildlife Park on Saturday for the grand opening of their new attraction, the World of Dinosaurs. 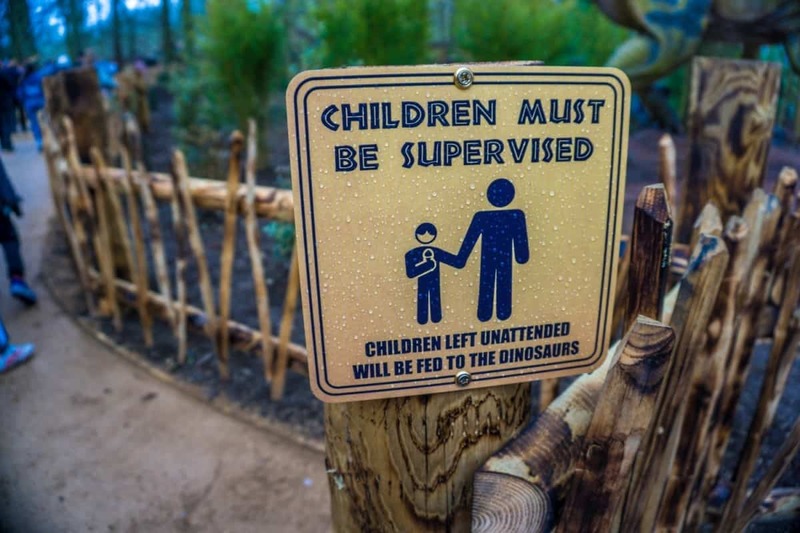 Now we’d not been to PWP before, nor any specific dinosaur experience so we really didn’t know what to expect. Our day was absolutely wonderful from start to finish, the kids loved it and we did too! I’ll start with the World of Dinosaurs but will share more about the Wildlife Park later on. 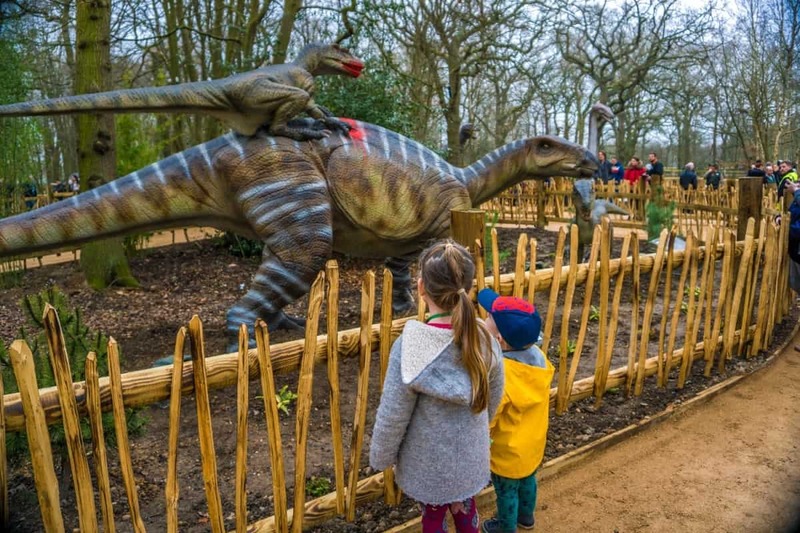 As part of the grand opening we watched a video about how the dinosaurs took their trip across the world, through all weathers to finally arrive at their new Hertfordshire home, and you could tell from the emotions in the team that the project had been a real labour of love, but what they created was magical and worth every long hour they must have put into it! 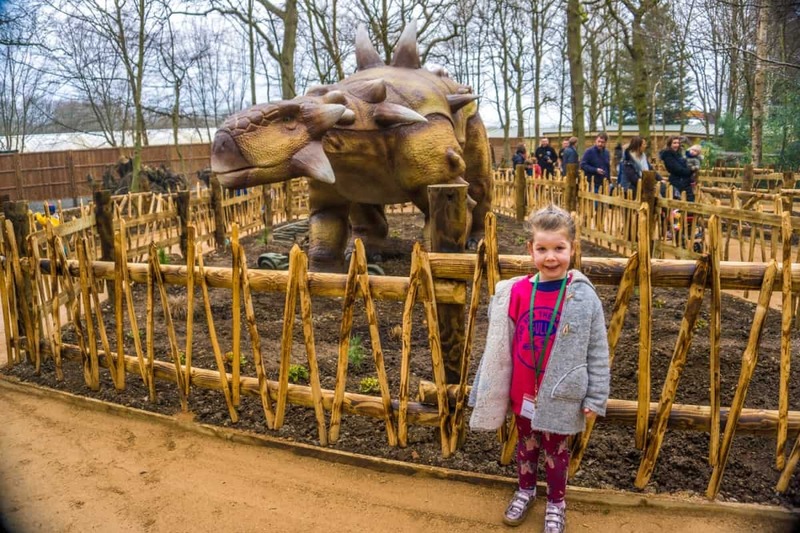 After a grand ribbon cutting to officially open the World of Dinosaurs by Emma Bunton, Emma Willis and Tom Fletcher, we were allowed in! We headed in through the gigantic gates and were ushered through the gaping pointy teeth, with dinosaur footprints leading the way. 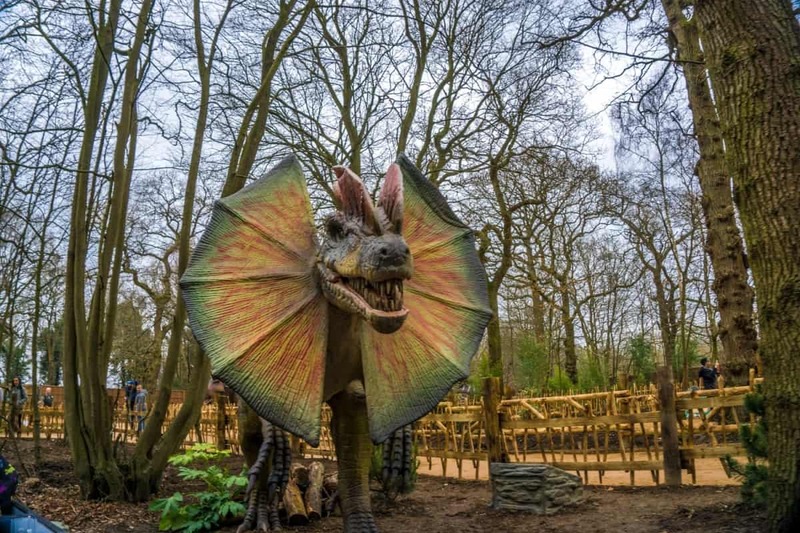 The trail takes you on a half mile journey through the prehistoric era, with the sights and sounds really immersing you into the world of dinosaurs! 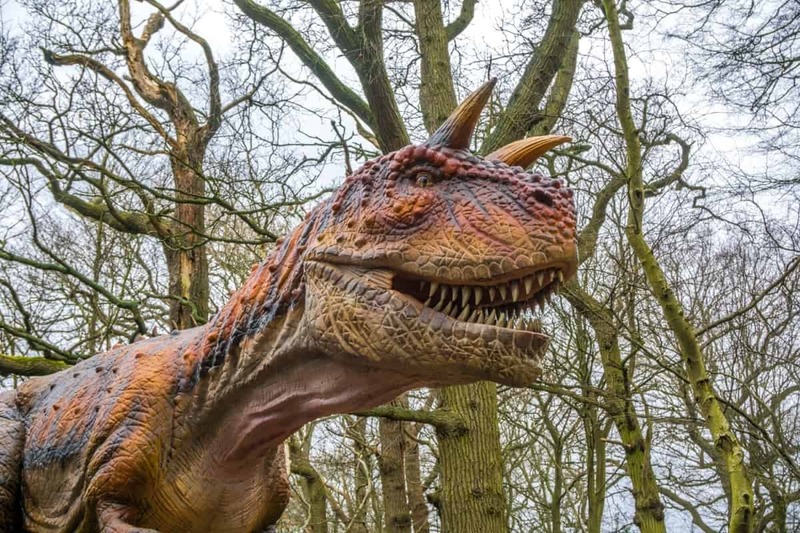 As you walk you’ll be spotting dinosaurs in all directions, making realistic (one assumes!) sounds and moving about as if at any minute they might just stomp off into the woods. The trail consists of a wide sandy path with nautral fencing and lots of flora about, which will grow wilder and leafier as the area develops. In the summer with all the trees above full of leaves it would be an amazing place to hide from the sun somewhere shady I think! Even now with the trees being more or less bare it still felt nice and secluded, with the only ‘modern’ thing being the information-plates near each dinosaur, giving you a brief history of the type of dinosaur, what size they would have been, what they ate and where they were found- one was even found in Sussex, where we live- how insane is that! 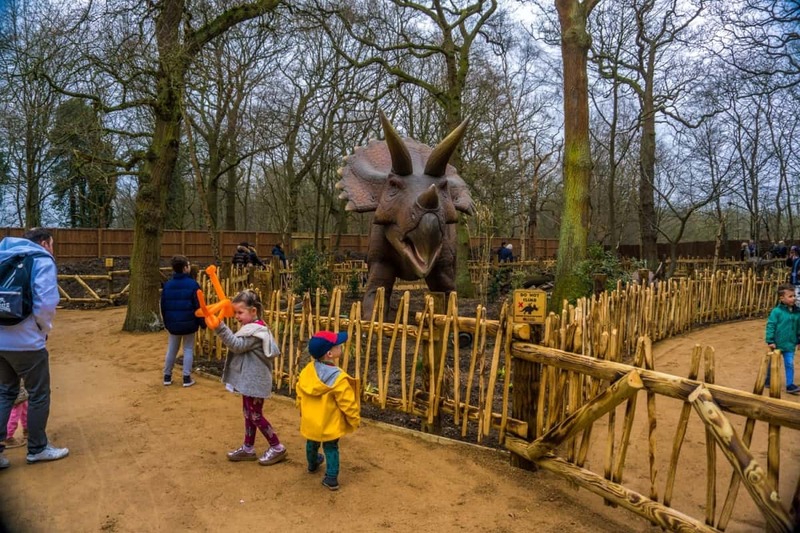 There are so many dinosaurs that we lost count, all the most common ones but some I’d never heard of before… but I did spot a few kids who seemed to know ALL the species of dinosaurs before they even saw the information about them – impressive! 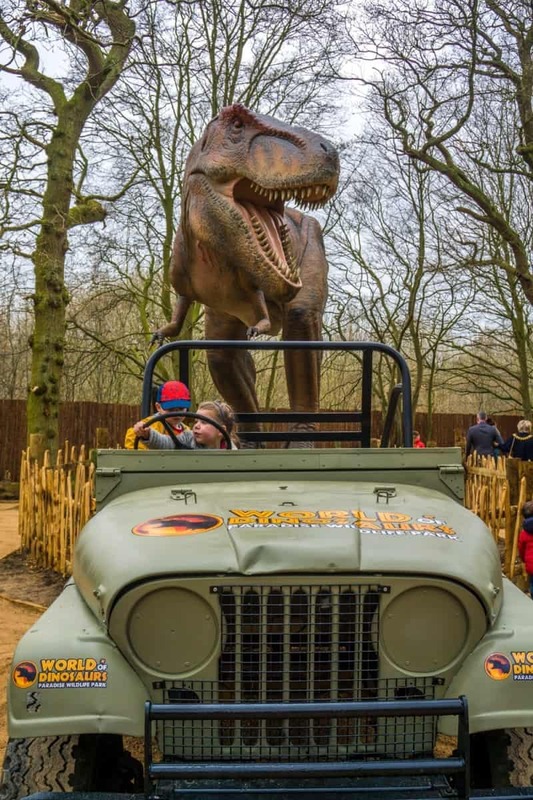 There were plenty of photo opportunities as you stroll around, including in a Jeep with a gigantic T-rex towering above you, and in front of a little dinosaur chomping on a bigger one! As the train comes to an end watch out for a dinosaur that spits! It really is so realistic, Athena was a bit wary of the T-rex and the sounds he was making, even though she knew he wasn’t real! Arlo of course loved them all, wasn’t afraid and was generally running about 20 feet ahead of us to see which dinosaurs were coming up next! At the end of the train there is a gift shop selling lots of dinosaur related toys and books, we bought Athena an egg that she had to chip away at to reveal a dinosaur and it kept her busy for two full hours when we got home- winner! 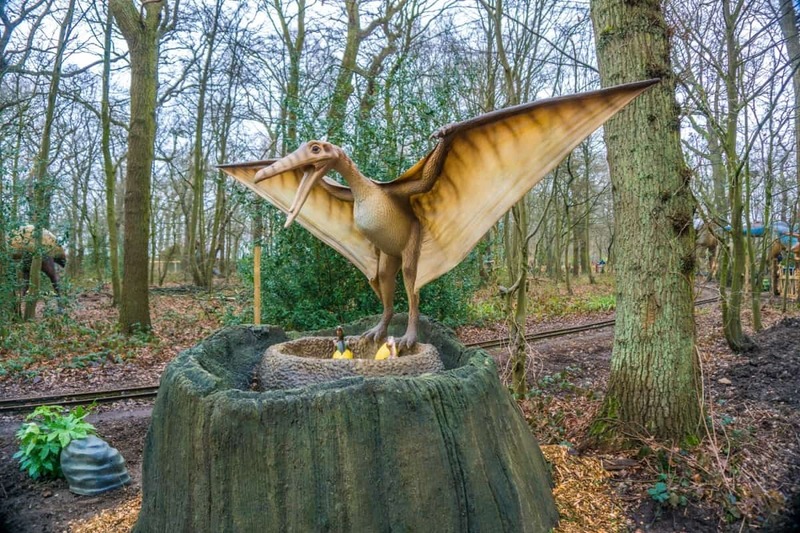 Just outside the shop are some picnic benches, some giant dino-eggs for pictures and posing and a fantastic sand pit where kids and dig for their very own dinosaur bones! 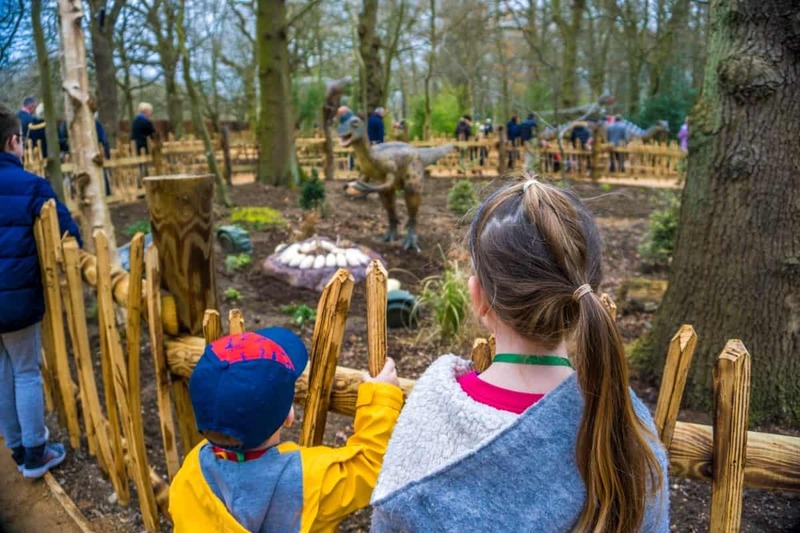 We also took a ride on the train that runs through World of Dinosaurs, to get even closer to some of the species, as well as running right alongside the wolf enclosure too! This is the only attraction that you pay for once inside the park, by the way, though there are a lot of coin operated smaller kids rides dotted about. From the train you can see some of the dinosaurs up close and personal, ones that were a little further away from the walking trail, so I would recommend it! Once we’d had our fill of dinosaurs we spent a couple of hours in the Wildlife Park, and especially loved the White Tigers, the arguing Zebras and the meerkats! Arlo loved the alligator and the HUGE snake too! 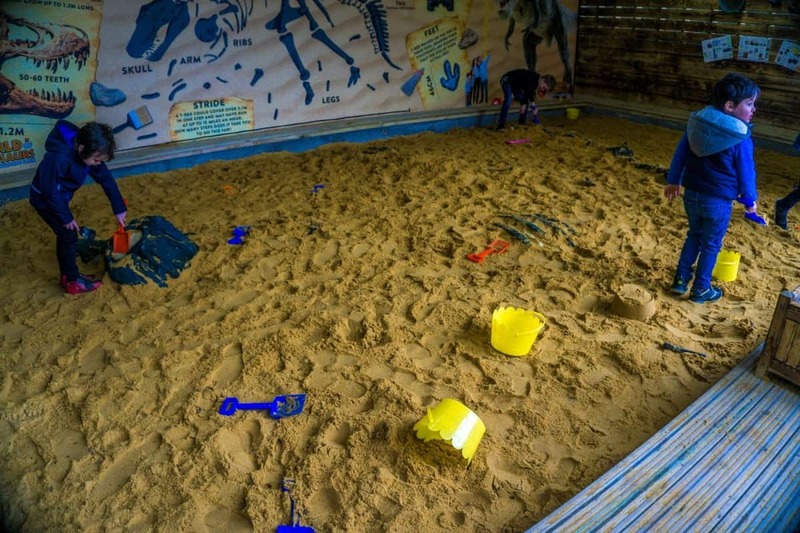 We finished the day with a hot dog and a play in the play park, but when we come back in the warmer months there is Paradise Lagoon, a big paddling area with slides and water jets, plus a soft play too – really there is so much to do, even before the amazing World of Dinosaurs opened up! 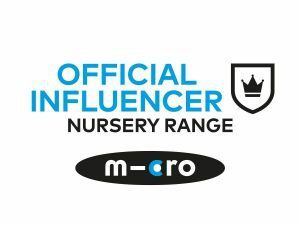 Situated just north of the M25 in Hertfordshire and easily accessible by road from all directions, with free parking. You could also get the train and take advantage of the shuttle service that PWP offers for a small fee to and from the local train station, Broxbourne. 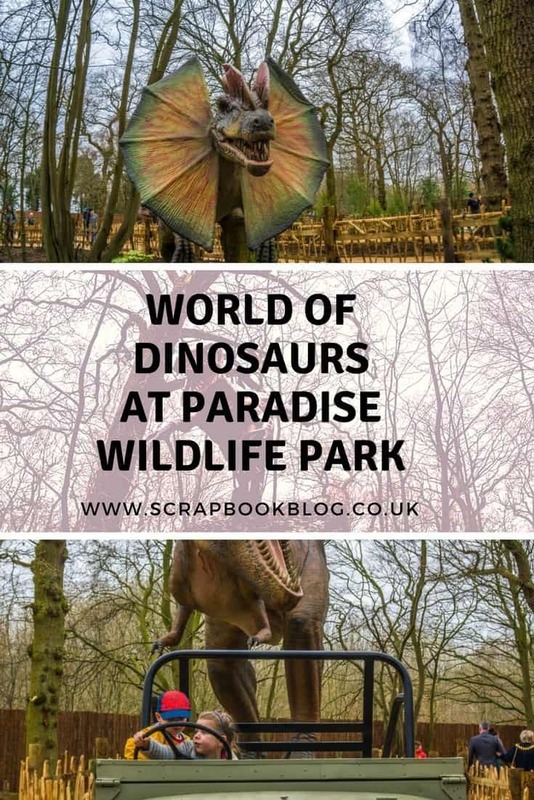 All details are on the Paradise Wildlife Park website. We were invited to be guests at the opening day of World of Dinosaurs in exchange for sharing our experience. For more family days out click here.